It's a disturbing image that shows just how devastating the heroin epidemic is, and the destruction it leaves behind. 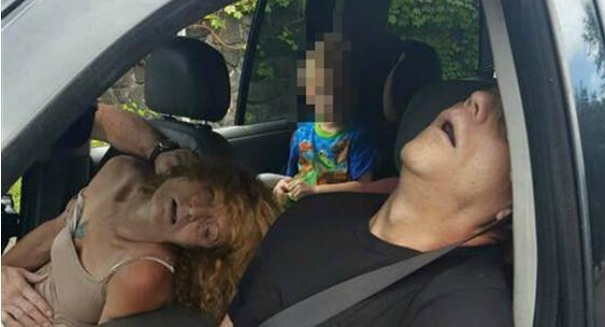 It’s a disturbing photo that is causing debate across the entire internet: an Ohio couple was found passed out in the front seats of an SUV after overdosing on heroin, leaving their 4-year-old child in the back seat to fend for himself. The Ohio city of East Liverpool posted the photos and police report on its Facebook page in order to illustrate the dangers of heroin. Fortunately, both the man and the woman are alive — James Lee Acord and Rhonda Pasek were arrested by an East Liverpool police officer shortly after the photographs. The city posted the photos because it felt like it was necessary to show the “other side” of heroin, and how it affects the children of those who use the drug. The 4-year-old boy was handed over to children’s services. He is the grandson of Pasek. The officer noticed the Ford Explorer with West Virginia plates driving erraticly, and the vehicle then braked hard and came to a skidding stop. The officer noticed his head bobbing back and forth, and his pupils had turned into pin points.